1. Did/do you always find running enjoyable? I started running when I was very young, 5th grade. Once I finished high school, I lost the LOVE of running. After my first son, I needed something to help lose the baby weight and fell into running again. 2. What is your favorite distance? I love the middle distances…half marathons. The shorter distance call for more speed, which I lack. The longer distances take endurance, which I’m working on. 3. What do you struggle with most in running? Nutrition. I find it hard to give up the foods I love. 4. Do you remember your first 5k, half marathon and/or marathon time? My first 5K was many, many years ago! My first half was a few months after I had my son. I ran a small race in Mason, Ohio in a time of 1:51 and thought I was going to die. I didn’t think I was going to be able to take another step. My first Marathon was last year, Warm Up For Columbus. I ran a 3:28:10 and qualified for The Boston Marathon. 5. What is your advise for someone looking to improve speed and/or endurance? Be consistent. The more consistent you are in your training the the more you will start to feel better with yourself. Adding in speed, weights, and better nutrition will all help shape your body and in return produce a faster, healthier runner. 6. What is your can’t live without running gear, besides shoes? I love my Stick! My calves and quads really get sore/tight. Being able to roll them with The Stick helps lessen the pain the next day. Now I need something to help stretch my calves better and then I’ll be set! 7. Ok shoes, do you rotate? If yes, how many in rotation – explain. I run in the same shoes for about 2 months, depending on the mileage I am running at the time. Within the last month of training I do like to break in the new shoes while still maintaining the old ones. I find it hard to find shoes I like so once I do it’s hard to give them up! 8. Do you have a mantra that you use when racing or training? My mantra while running is always to stay positive. When I tend to get tired, negative thoughts can creep into my head. Once that happens I find it very hard to get back on track. Trying to stay positive helps me finish my run/race putting forth everything I have. 9. Do you ever feel unmotivated to train? If so, how do you overcome? Of course. When I’m tired from the day, work, or just life, I find it hard to get motivated to train. I try to look at my next race and think about my goals. The only way to get me to start the run is to remind myself of the ultimate goal. Also having people who I know will see/ask about my run helps me stay motivated as I don’t want them to think I am slacking off! 10. What is the best thing running has given you? The best thing I have been given while running is having my identity back. When you have kids I think it easy to lose yourself. You always want to give everything you have to your family and kids first. Setting aside a time to run, even in the early morning hours while everyone is still fast asleep, I know I am doing something for myself. I also love how my kids see that setting goals and working hard will result in positive outcomes in life. Erika is an inspiration to us as we watch her juggle her busy life and manage to run some amazing times. 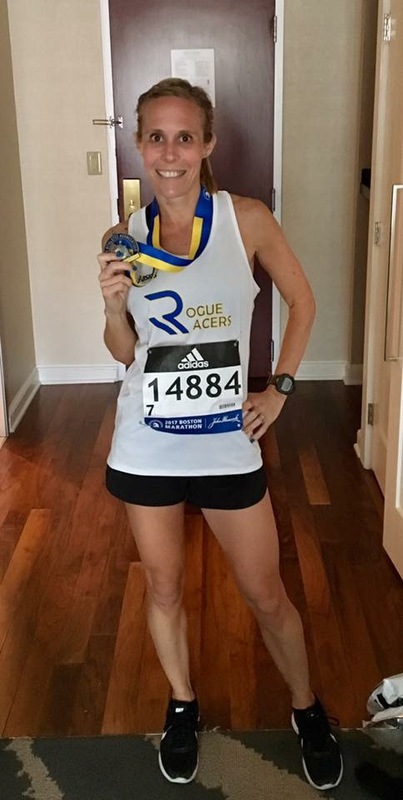 With only 2 marathons under her belt, qualifying for Boston in BOTH of them, we cannot wait to see what’s next with more training and experience.